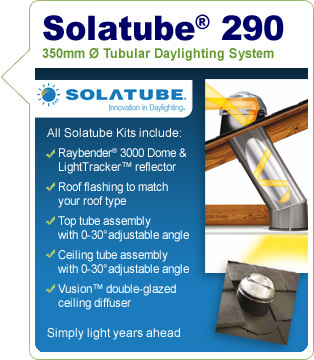 Each Solatube kit is provided with a "Raybender 3000 Dome", roof flasing, top-tube with 0-30 adjustable angle, ceiling tube assembly with 0-30Â°adjustable angle, "Vusion" double-glazed ceiling diffuser, seals, sealants and fixings. Installation requires climbing and working at dangerous heights. Use extreme caution to minimize risk of accidental injury and property damage. Installation should taken around about 4 hours. See the installation manual for a step by step guide.